SYRACUSE, NY (WRVO) – Rep. John Katko (R-Camillus) and Rep. Anthony Brindisi (D-Utica) have introduced legislation that would pay transportation security officers during the partial federal government shutdown. It is an example of the bipartisanship and compromise Katko, a Republican, and Brindisi, a Democrat, say is needed to end the shutdown. On Saturday, President Donald Trump offered a deal to Democrats to reopen the government: a three-year extension of DACA or the Deferred Action for Childhood Arrivals, in exchange for more than $5 billion for a wall along the Southern Border. 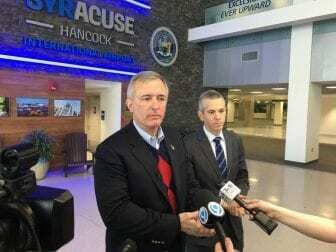 Speaking to reporters at the Syracuse airport before they flew back to Washington D.C., Katko and Brindisi appeared to be in agreement with the proposal. Brindisi said he wants to review it first, but said it’s a step in the right direction. Katko said he would support the deal and he said Democratic House Speaker Nancy Pelosi should negotiate a permanent fix to DACA with Trump, which Katko said Trump might go for. In addition to paying transportation security officers, Katko said he’s also signing on to a Democratic-sponsored bill that would pay air traffic controllers during the shutdown.